I have one of those USB-based logic analyzers that needs Windows software to make it go. I had been doing Windows-in-a-window with VMWare, but it’s kind of a pain. If I were to use a real Windows laptop, I’d need a shelf or something for it. I wanted it above my oscilloscope, which meant a laptop stand that was taller and wider than most. Time for the laser cutter! 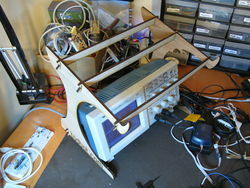 – be wide & tall enough for the oscilloscope to fit underneath and be usable. The 1/4″ (0.20″ really) plywood is cheap, from a big box hardware store. I think I paid $10 for a 4’x8′ sheet of it, and they nicely cut it down to 2’x4′ sheets for me. 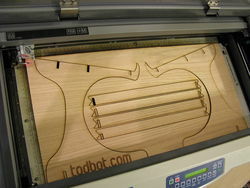 It ended up fitting pretty exactly on the 12″x24″ cutting bed of the laser. What prodded me into doing this was the great Cardboard Laptop Stand I saw the oomlout guys had just received. 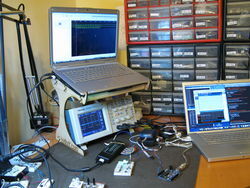 Also, there are so many great DIY laptop stands on Instructables, they created a whole category for it.